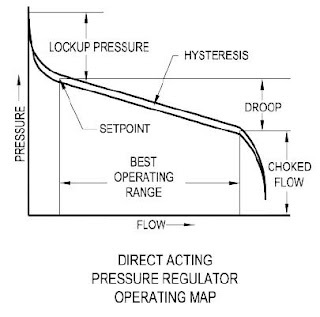 I thought that once you set a pressure regulator to a certain position, the corresponding pressure would stay constant. Turns out that's not the case. If you turn off the air and reapply it, the pressure will be completely different. Gauges are accurate, regulators are imprecise. Every time you reapply air to a regulator, it needs to be adjusted on the gauge to provide the pressure that you need. If you change the regulator input pressure, the output also changes, not much but it doesn't stay constant. That doesn't seem too regulated to me. I need very exact pressures to the pressure pots to provide a constant, measurable, flow of materials to the spray gun. Plus or minus 10% is not good enough. My solution was to regulate the regulators. I regulate the air coming out of the compressor to 40 psi. This is then regulated to 20 psi at the tank with another regulator. and then a 3rd and final stage is the only regulator that I have to actually adjust provides the pressure to the tanks. This 3 stage regulation works very well and the pressure stays right where I need it, plus or minus 1%. 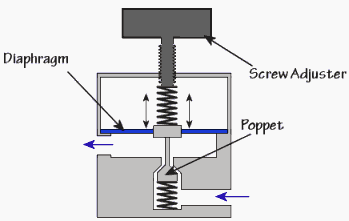 From the picture on the right, when the outlet pressure equals the spring pressure on the diaphragm, the poppet valve closes. It won't open again until the outlet pressure drops somewhere below the spring pressure. This will cause fluctuations in the output pressure every time the poppet valve opens and closes. Regulators are also not very accurate in the extremes. Either very low of very high pressures don't allow the internal spring tension to work in a very linear manner. To solve both of these problems, I put a calibrated orifice on the tank. Basically I drilled a hole in a fitting. This always leaks air at a constant rate and keeps the poppet valve always slightly open and makes the spring tension operate more in the middle of it's range. This would be a stupid idea if I was trying to regulate the pressure of something like Propane, but it is just air and so what if it leaks. The bottom line is that you must adjust the regulator pressure to read on the gauge exactly what you want every time you set up the system. Trust the gauge, not the regulator. “and wants to attack you"
What can she be thinking of?